Do you consider discovery online when you pick a title for your new book? Where are you going to promote and market your new book? If your answer is online, the Internet and social media, you need to think about how your book title is going to work for you. How will a potential reader find your book? Your title and short book description are going to be the two of the most vital elements in attracting online interest on perhaps hundreds of websites and platforms. So you need to get it right with the perfect title. Perhaps you already have a working title or one based on the main character or setting. Or you can use title generators to give you a random title, which is also an excellent way to start getting title ideas. But, no matter how you plan to research and choose a title, have you given any thought to these three crucial factors? 1. How will it fit into a 60 character SEO title? 2. What will the 160 character SEO meta description be? 3. Will it form a pretty URL? If not, then I suggest you read on. What’s the difference between an H1 tag and an SEO title? These two tags cause a lot of confusion, so it is critical to understand the difference and how they both work. Page titles are part of the page content, and you write them in the head section when you prepare your web page or blog post. It is an HTML element that is called an H1 meta tag and is used to create the page URL. In the image below, you can see that the title and URL are the same. SEO titles are not seen on page. But at the bottom of my editor, I can add a different SEO title. They need to be unique titles, and an optimal title should not exceed 60 characters. Both should include the important keyword or keywords, but only once. In the examples above, the keywords are “promote your/my self-published book”. Google doesn’t take much notice of pronouns and prepositions, hence why I used my and your in the two titles. So why are there two and why are title tags important? Firstly because Google search will index both. Yes, twice! Secondly, because each one can be found with a different search query. In the examples below, my post can be found with the search terms such simple ways, best way, ways to promote or best way to promote and each will then appear on a different Google result page. It really increases click-through rates. Think about how useful this is for your book title. You can have two different ways to have it indexed. But again, both must be 60 characters at most. The exact same thing happens on social media. Look at how Twitter and Facebook use both H1 and SEO tags. This means that searches using keywords from either title will result in a post being found on social media networks. Now you know precisely why it is very important to understand how to use both page titles and SEO titles. If I use a simplistic example of a book called Fiesty Fiona, there are endless possibilities to exploit what can be done to dramatically increase online discovery by writing variations of a good title tag to use as an SEO tag. Excuse my playing with alliteration, but you can see how easy it is to add extra searchable words to turn a book title into multiple on page SEO titles. Use mostly nouns, verbs and adjectives. Avoid using wasted words such as book one, volume two or boxed set. Keep linking words and articles to an absolute minimum because they have no search value and use up precious characters. These are referred to as SEO stop words. Never use keyword stuffing because Google can penalise this practice. This is when you repeat the same words or phrases within the title. For you book title, consider keeping it to under 25-30 characters because it then leaves you 25-35 characters available to create fantastic variations everytime you post about your book. That flexibility will give you a huge SEO and Google search boost. Having a keyword rich title will also help you with Amazon search as it works in a similar manner to Google. Think about keeping your title and sub-title to around 60 characters in total. The page meta description is a vital part of search engine optimization (SEO). It appears on a search engine results page (SERP) to give a brief description of the page content following a search query. The standard length has a 160 character limit. However, depending on how Google indexes a page, it can sometimes vary. It is best to stay around 155 characters to make sure it is not cropped mid-sentence. If you have the facility on your blogging editor, you can write meta descriptions. But if you don’t, Google will use the first sentence in your post or article. This makes the first 150-160 characters of your text extremely important. Never start a post with meaningless text. 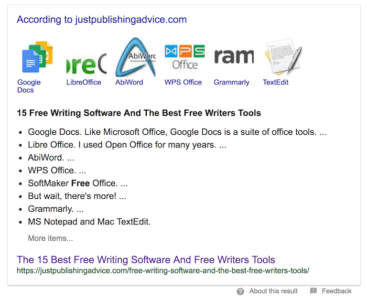 Similar to the two title tags, meta description tags should include your main keyword (your book title) only once. You can then enrich around it with more keywords or phrases. Be careful not to repeat any meta keywords you used in your titles. Avoid all unnecessary punctuation such as dashes, quotation marks and colons. Use clear, simple and concise sentences that are very easy to read. If you can add a separate SEO description, never use the first lines of your text as this will result in duplicate meta descriptions, which will reduce your chances of getting indexed. The combined result of using well-crafted titles and descriptions is that you have 220 characters to incorporate a variety of searchable words and phrases. Getting your meta title and description just right can bring huge rewards from ranking algorithms. If you are really lucky, getting one or two Google rich snippets such as the ones below can boost organic traffic enormously. As an aside, if you use H3 heading meta tags for your paragraph headings, Google sometimes creates a listing rich snippet as in the example below. Understanding the basics of SEO, titles and descriptions before you start your research and pick a title can bring surprising rewards that will make your book more prominent in online search. What is a URL and how can it be pretty? A Uniform Resource Locator (URL) is most commonly called a web address or website link. It is what you see in the address bar of your browser. It is also displayed in Google search results. There are two parts to a URL as in the example below. The first part is the site address, in red, and the second part is the page address, in blue. It is an example of a pretty link or URL. The contrary would be an address consisting of irrelevant information such as dates or page extensions. Pretty links send a clear message to both users and search engines. Your site address can’t be changed, but the page address can and should be a logical phrase that can be easily read and understood. Your book title is going to appear in URL links on a lot of sites, so it needs to work in a tidy URL structure. On almost all sites, the page URL is taken from the H1 page title, but only if it is set for pretty links. You won’t have control over external sites, although most use these types of links. Even Amazon include the book title in a book page URL. But on your own site, you should make sure your permalink settings are correct and set to add post titles to form pretty links. When you publish a new book, you want people online to be able to find it. But your title and author name alone will not bring results unless your name is Stephen King or Dan Brown. This is why you need to wrap your book title in keywords when you write articles or posts for your blog, or for other blogs and sites. If you are writing for an external site, make sure you send two titles and a meta description for the webmaster to use. • Keep your book title to under 25-30 characters if possible. • Make a long list of keywords you can use with your title to create many unique titles for articles and posts. • The first 160 characters of any article or post you write about your new book are vital for SEO. • Use pretty URLs on your blog.